Ode to Finch, 2012, 49 ½ x 37 ½ in. Courtesy of the artist. Sandra Muss has a unique approach to making her art, which develops from gathering disparate raw materials that seem to be naturally and precisely sewn into a movable feast of colorful palettes that she incorporates into her distinctive style of work. A visit to her studio can be an eye-opening experience, due to the remarkable supply of miscellaneous objects that she has amassed and the stimulating assortment of organic specimens with which she surrounds herself. Like Picasso, who was known to walk around Paris with an empty baby carriage looking for roadside paraphernalia that appealed to his creative interpretation (see: Bull's Head, 1942), Muss finds the same stimulus in foraging about the countryside on a lifelong treasure hunt for the right stuff that is the essential core of her work. It's as though her eye acts like a natural sponge, soaking up the maximum amount of the flavors and spirits of found inventory that is neatly compartmentalized, waiting to be adaptively reused at the right moment in one of her idiosyncratic assemblages. On one side of the studio, a visitor can discover a treasure trove of plants, dried flowers and branches, bird feathers and bones, snakeskins and shells, papers and printed fabrics, all waiting in line in a dress rehearsal for the artist's opening night curtain call. In another corner, one can find things with a "ready-made" aesthetic that might have been inspired by Marcel Duchamp. Like many engaging artists, Muss may not know initially what she might salvage out of a found item, but it's clear that she knows when the decisive moment is upon her to magically pull from her artist's top hat exactly what the secret formula requires. Judging by the variety of components on display at the Coral Springs Museum of Art, Sandra Muss obviously is on the move, wasting no time as she travels about the globe, keeping her eyes open while acquiring miscellaneous trinkets and memorabilia that keep her inspiration and motivation on fire. Bhutan Prayers, 2011, 31 x 28 in. Courtesy of the artist. John Chamberlain, the late great sculptor of abstract metallic forms, realized great inspiration in amassing huge stockpiles of multi-hued, rusted, scrapped automobile sections that indeed were the foundation for his idiosyncratic palette. 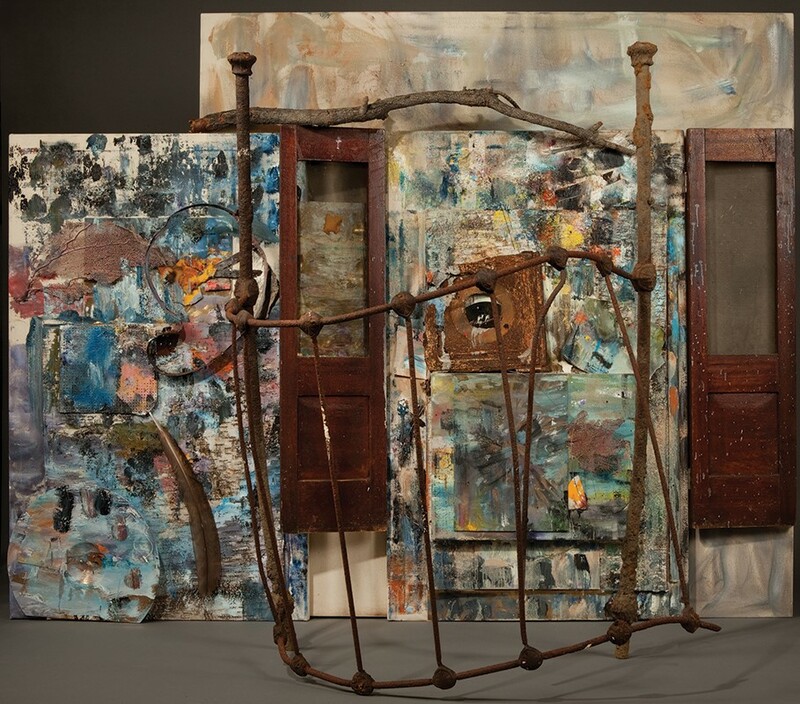 Robert Rauschenberg, who, like his friend Chamberlain, maintained a home and studio in Florida, surrounded himself with things that he admired. His backyard, which he called his personal junkyard, was chockfull of wondrous objects that eventually he would secure to his luminous silkscreened aluminum panels, which became a signature technique in the last years of his long and prolific career. His use of overlapping collage fragments had no limits: instead of a feather he would use the whole chicken; rather than a ram's horn, he would use the entire goat. An unmade patchwork bed with a painted pillow, produced in 1955 by the radical young artist and now in the permanent collection of the Museum of Modern Art, would become a vertical assemblage that may be one of the most famous works of art he ever made. Sandra Muss follows the same basic instincts; employing paint, cloth, assemblage, and abstraction. She pays respectful homage to Rauschenberg in particular, for metaphorical example, in the cover illustration of this exhibition catalog, where she utilizes a vintage cast iron bed frame as a compositional characteristic that supports an array of visual elements. This work, titled Meet Me in the Sky, also celebrates the great tradition of the legendary abstract expressionists like de Kooning, who concentrated on non-narrative painted gestures with an occasional snippet of paper clipped from a magazine glued down over his painted surfaces. Meet Me in the Sky, 2011, 60 ½ x 80 x 40 in. Courtesy of the artist. The core of Muss' work is based on traditional collage and assemblage, the methods initiated by Braque and Picasso in 1914, and to a certain extent the constructions of Joseph Cornell and Antoni Tàpies. 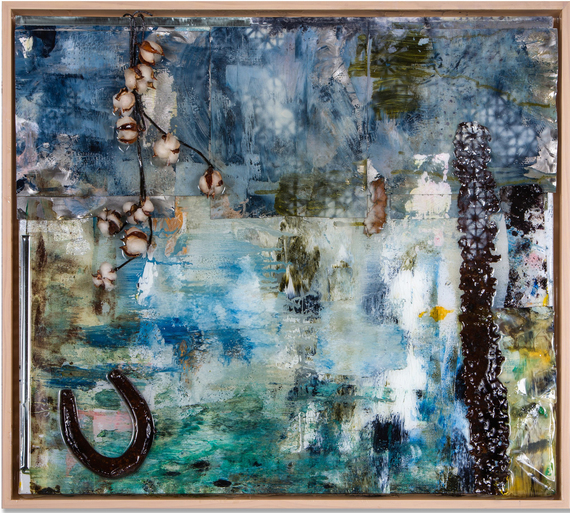 With a complicated formula of disparate ingredients, Sandra Muss mixes and matches a range of natural-based tones that are hemmed together with bits of rusted brown metal, providing a thoughtful homogenized process until all pieces come together as one complete composition. Like these early pioneers, Muss obviously has a fondness for experimentation and risk-taking, which leads to endless possibilities and directions as the artist stitches together odds and ends with her intuition and love of procured objects. 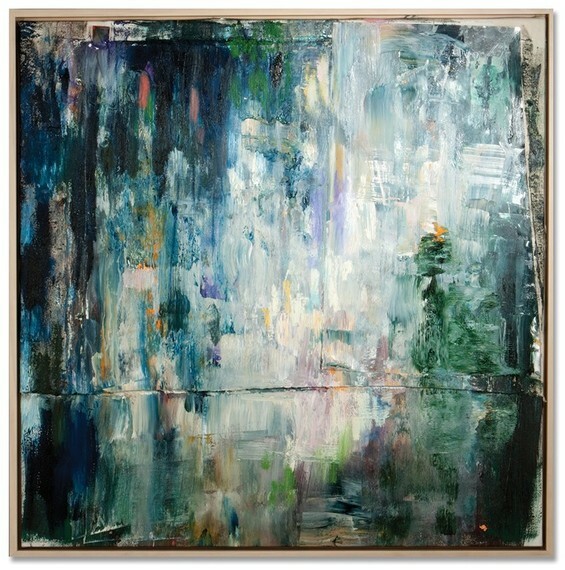 An impressive sample of the artist's use of color harmony and interaction is Genesis 1, a mixed media work that is bathed in various rich shades of blue. Genesis 1, 2014, 31 ½ x 28 ¼ in. Courtesy of the artist. 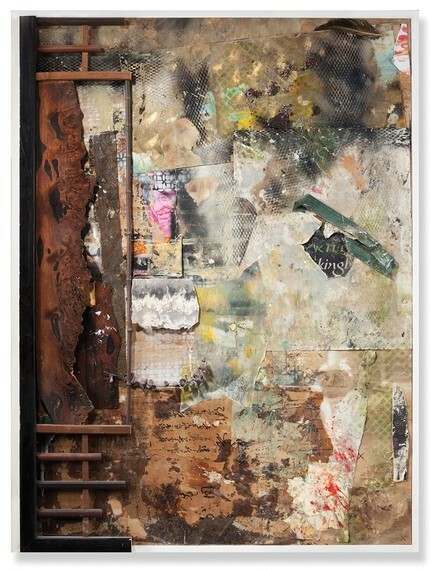 The basis for this painting is a series of overlapping squared paper sections that have been ripped and covered over, as if they were aging layers of weathered outdoor street posters. 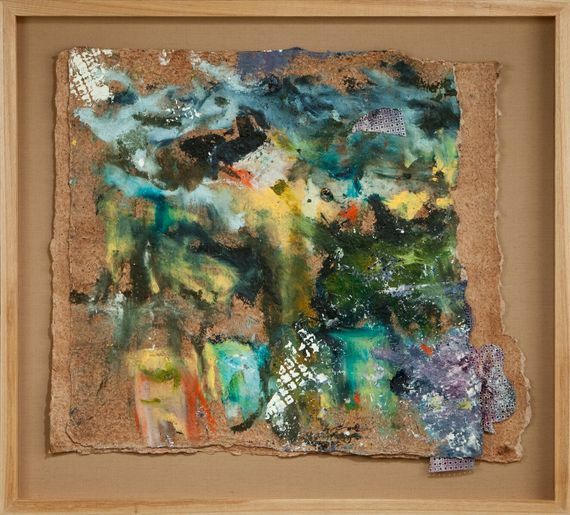 The uneven edges set down into the frame also emphasize the rugged collage quality of this arrangement. 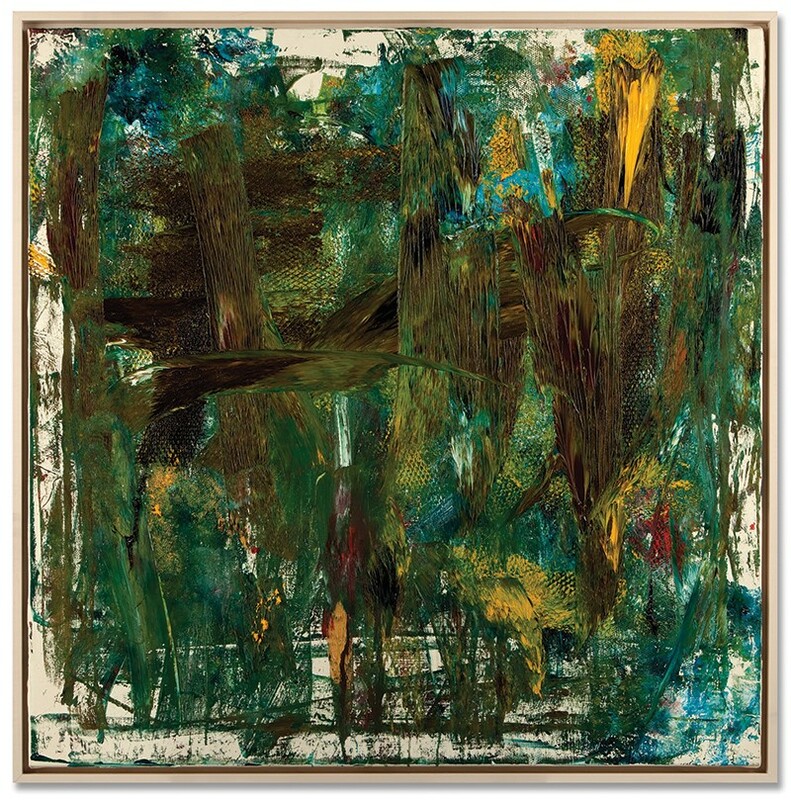 Heavy brushstrokes start to build up painterly energy vertically and horizontally, offering a comfortable resting place for a selection of items adhered to the surface. Bits from a patterned piece of metal are also glued down after Muss has used it as a stencil, where a spray-painted area nearby creates an intriguing matching shadow. A stick of cotton balls just off the vine adds an organic touch opposite the metal fragment, as well as a horseshoe placed in the bottom left corner for good luck. Twelve Thirteen, another appealing mixed media work, shows off a confident organizational skill that also takes a cue from Rauschenberg-ian components, such as bird feathers and seed pods. The remainder of the composition utilizes cut, painted papers with a black and white stripe design, adding a zig-zag movement within the picture plane. Twelve Thirteen, 2014, 49 x 41 in. Courtesy of the artist. 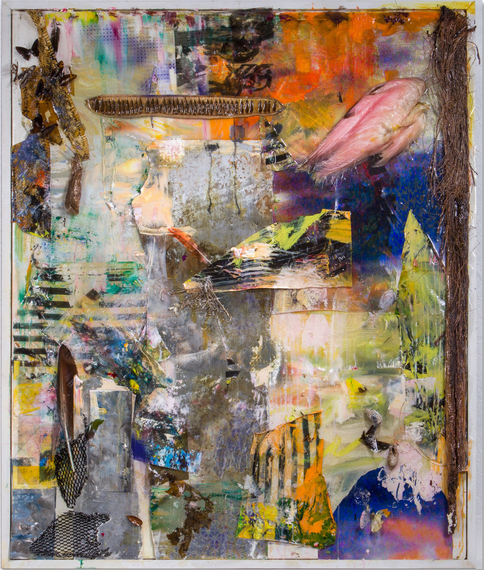 In most of the artist's assemblages, there is a spirit of theatrical sets that support an ongoing drama of interaction between playful shapes and eccentric color mixes, and Muss has fashioned her own confident and independent visual language that offers a beckoning dialogue with the observer. In this museum survey, a common denominator literally has been embroidered into the works, often with wire or string throughout reinforcing each piece, offering a seamless journey of unique ingenuity and intellectual interpretation. This ambitious overview is a warm, paint-stained handshake and a grateful, standing salute to past award-winning innovative performances in a supportive role by pioneer picture makers. At the same time, it is a inquisitive and delightful investigation into the identifiable innovative soul of a multi-talented artist whose time has come. Veils of Light, 2010, 36 ½ x 36 ½ in. Courtesy of the artist. Mango Latte Frenzy, 2011, 41 ½ x 41 ¼ in. Courtesy of the artist.